Just in case you may have missed it, last weekend Apple released a security update to iOS brining the mobile operating system to version 4.3.4. The latest security update is largely intended to plug a security hole in how an iPhone, iPad, or iPod touch handles malicious .pdf files to allow hackers to by pass safeguards in the operating system. This same security hole was a means to allow people to install applications from Cydia, a third-party application source other than the iTunes App Store. This process is commonly referred to as "jailbreaking." 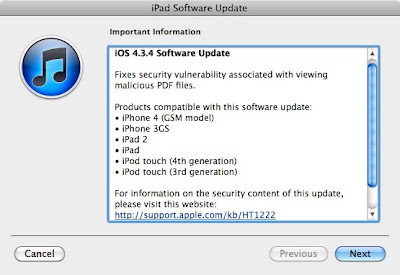 iOS 4.3.4 was simultaneously released for the iPhone 4 (GSM edition), iPhone 3GS, the iPad 2, the iPad, and third and fourth generation iPod touch devices. iOS 4.2.9 was released specifically for the iPhone 4 (CDMA edition) on Verizon's network.